One person has been feared killed after explosion rocked a popular pharmaceutical company in the Moore area of Ile Ife, Osun State, on Saturday. The explosion, which happened around 10.30pm, was said to have started a fire as pharmaceutical products worth millions of naira were reportedly destroyed. The explosion was also said to have affected some of the adjoining buildings, while the area was cordoned off by the police. Residents told journalists that an improvised explosive device was planted in the building. A resident, who identified himself only as Tope, told Punch that one victim was trapped in the rubble. Tope said the victim, who he claimed was a relative of the owner of the building, had been badly injured when he was eventually removed by emergency management workers. He added that the victim was rushed to the Obafemi Awolowo University Teaching Hospital Complex where he died on Sunday. His claim was also corroborated by some of the people at the scene. Another resident, Tola, said, “The building came down around 10pm on Saturday. The owner of the building died in November 2017 and there was a crisis on the sharing of his property, which included the building. “The workers at the pharmaceutical company closed around 8.30pm and we learnt that somebody sneaked into the building and planted the explosive. The leader of firefighters in the state, Mr. Mike Ogundipe, told Punch that his men put out the fire that resulted from the explosion. He said firefighters also went back to the scene on Sunday to ensure that the fire did not re-ignite. The Police Public Relations Officer in Osun State, Mrs. Folasade Odoro, when contacted on the telephone, promised to find out and call back. She had yet to get back to our correspondent. However, she posted a situation report on a Whatsapp platform where she said the cause of the incident had yet to be ascertained. 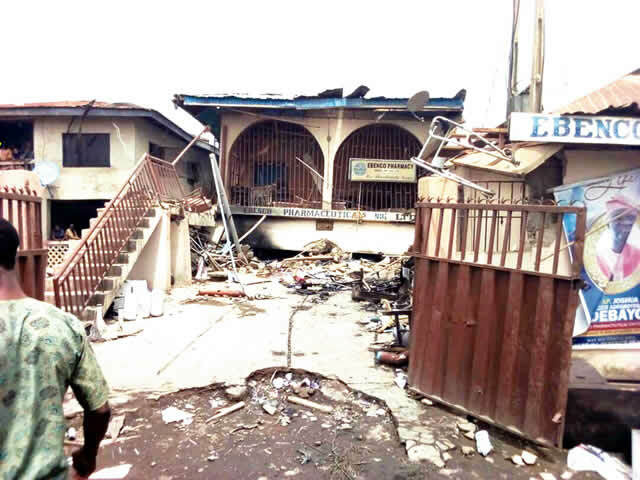 “One Adebayo Seun of Moore Street, Ile Ife, reported at the ‘A’ Division that around 10.15pm, after closing their pharmaceutical shop, someone called him that there was a fire incident in their shop. The Public Relations Officer of the OAUTHC, Kemi Fasooto, could not be reached to confirm if anybody was brought to the hospital from the collapsed building. The Chief Medical Director of the OAUTHC, Prof. Victor Adetiloye, said he could not confirm or deny if any victim was brought to the hospital because he had yet to be briefed on the incident. The Ooni of Ife, Oba Adeyeye Ogunwusi, asked the people of Ile Ife to remain calm, saying the situation was under control.